Review posted April 29, 2017. Top Shelf Productions, 2015. 187 pages. I’m embarrassed I hadn’t read this book yet. I meant to, but graphic novel isn’t my preferred format, so I didn’t get around to it. But I loved March, Book One. So when March, Book Three, swept the 2017 Youth Media Awards with four wins, and I got a copy signed by John Lewis, I knew I needed to catch up. This volume continues John Lewis’s story, still framing it against the background of Barack Obama’s inauguration. In this book, John Lewis joins the Freedom Riders. They face tremendous violence and are arrested many times. Throughout, he remains committed to nonviolence – even in the face of violence. They wouldn’t post bail and give money to a segregationist state, but took the consequences of their actions. I misspoke in my review of the first book. The “March” of the title is not the March on Washington, but an intended march from Selma to Montgomery to protest for voting rights. They were met at the Edmund Pettus Bridge by Alabama state troopers in a bloody confrontation. 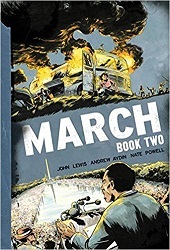 In this second volume, they did cover the March on Washington, where John Lewis was one of the keynote speakers – and the only keynote speaker of that march who is still alive. The book ends with the bombing of the Sixteenth Street Baptist Church in Birmingham, Alabama. The violence was escalating. I like the way Barack Obama’s speech is quoted before the bombing is shown. “Mindful of the sacrifices borne by our ancestors.” Some of the sacrifices weren’t so long ago. This isn’t ancient history, but so far, these events happened before my birth. I appreciate having the story laid out for me. It’s moving to see what peaceful, nonviolent protest can accomplish.